Black and white negative showing a group of people at the sod turning ceremonies for the Natlie Knitting Mills. 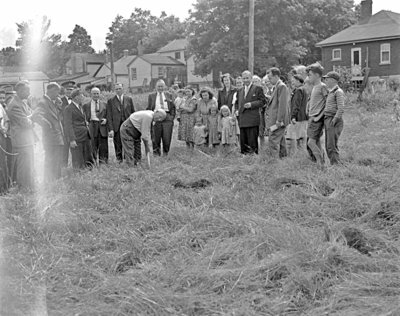 Whitby Mayor, Robert M. Deverell, can be seen turning the sod in the group of dignitaries. Sod Turning for Natlie Knitting Mills, 1946, Marjorie Ruddy, Whitby Archives, 15-014-001.